Microsoft is hosting a convention in San Francisco right now called X10 and predictably has announced a lot of news about its upcoming games. The first "X" Event to be held since X 06 in Barcelona, Spain, Microsoft is currently feting the game journalists of the world in San Franscisco and showing off it's 2010 lineup. The event is happening right now but here are some of the highlights so far. 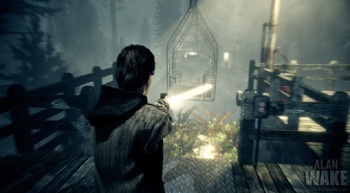 On the front burner is the release dates for one game that we've known about for a quite a while; Alan Wake is out on May 18th in North America and May 21st in Europe. Alan Wake was first announced almost five years ago, at E3 2005, and is designed by the Finnish team that made Max Payne, Remedy Entertainment. The game takes cues from TV Thillers like Twin Peaks and Lost by telling the story of a novelist whose latest work appears to be coming to life. The Halo Reach multiplayer beta will open on May 3 to owners of Halo: ODST. There was no date given on when the game itself would be released. The Game Room, as well as XBLA games Perfect Dark and Scrap Metal are definitely coming this March during the Xbox LIVE Arcade Block Party, whatever that is. Apparently it's just a string of releases on XBLA, starting with Toy Soldiers on March 3. Other games: Dead Rising 2 coming out on Aug. 31 in N.A. with a DLC for the first game called CASE ZERO which will act as a prologue. Lost Planet 2 was also dated as coming out in both N.A. and Europe on May 18. Whew. That was a lot. Thanks, Major.